We left Washington State and entered Oregon via Interstate 5 South and then went west straight across the top on US Highway 30. We landed in the very northwestern tip of the state, in the Astoria/Warrenton area and spent a night at the Kampers West RV Park. The sites were a bit tight but overall, it seemed like a nice campground. It was definitely all about fishing; there was a huge fish cleaning area with multiple sinks right at the very front of the park. 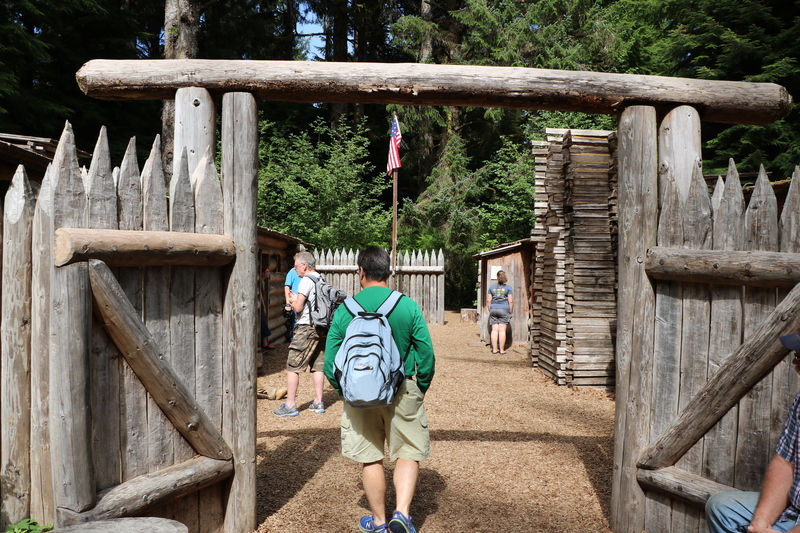 When we were looking on line for an RV park to stay in, we realized that Fort Clatsop , where Lewis and Clark spent their final winter before heading back east, was right by the campground we chose. The photo above shows the replica of the structures where the group camped from December 1805 to March 1906. The grounds also have a small bit of hiking as well as a visitors center with exhibits that explain Lewis and Clark’s mission. About five minutes from the campground is Fort Stevens State Park. 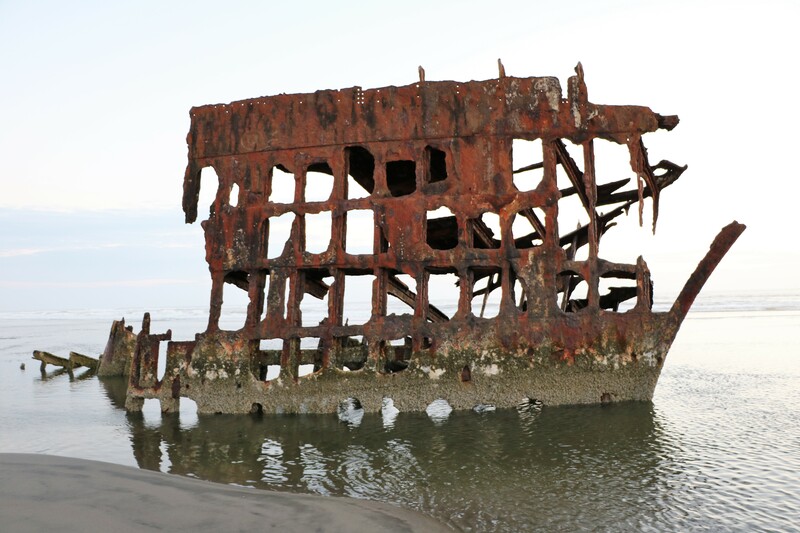 On the beach is the Peter Iredale, a ship wreck that ran ashore in 1906. It has slowly been deteriorating ever since. 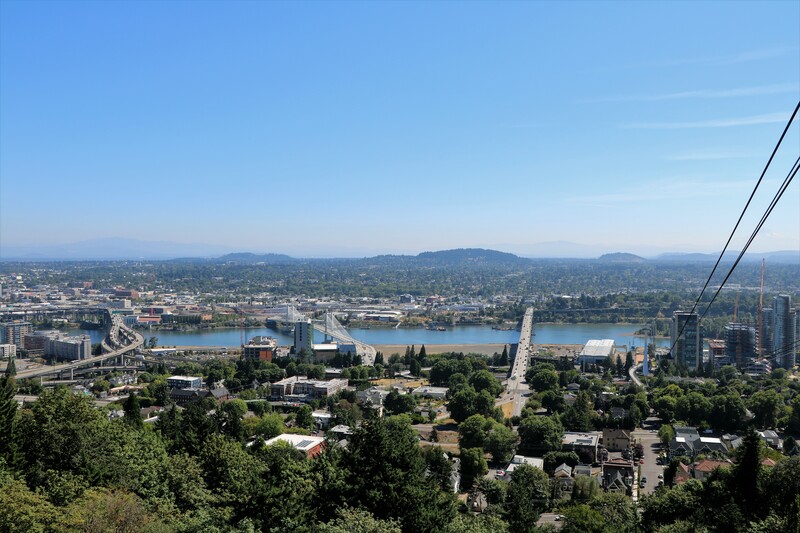 We left Warrenton to spend a day in Portland. We took advantage of the hop on, hop off Pink Trolleyr and toured the city. There are 13 stops on the trolley and they include gardens, parks, and the zoo. 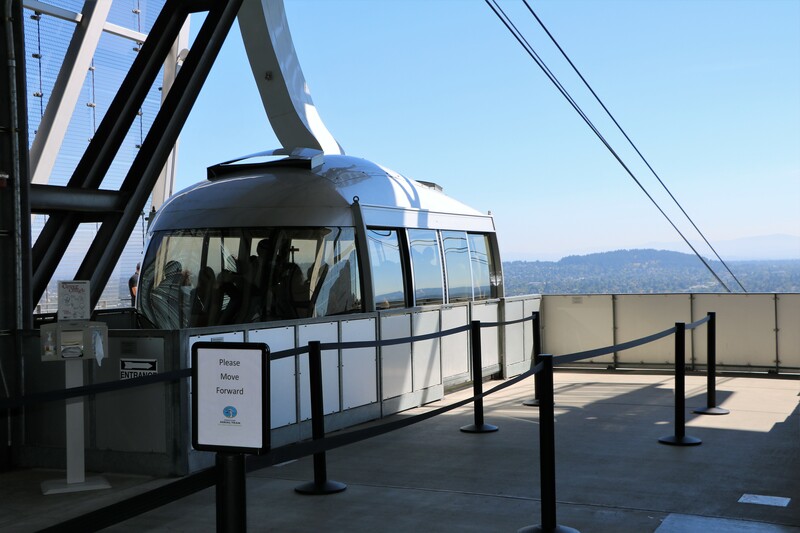 We got off at stop 12 and rode the Portland Aerial Tram We took the three minute ride over the city and I snapped the photo above this picture of the tram. For lunch we went to Jake’s Famous Crawfish. It was founded in 1892, moved to its current location in 1911 and was bought by Bill McCormick and the general manager was Doug Schmick. While working together they developed the concept of McCormick and Schmick’s restaurant chain. 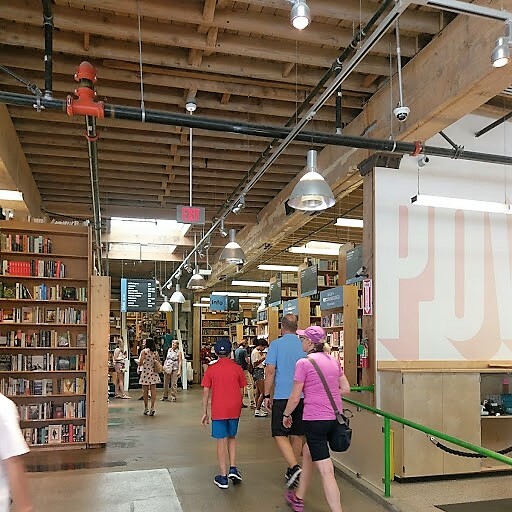 After lunch we checked out Powell’s City of Books which claims to be the largest new and used independent book store in the world. It was huge! Upstairs there is an Espresso Book Machine which will self publish one copy of a book at a time. Then we drove back to where we had parked the motor home and drove to Cascade Locks. We stayed at the Cascade Locks KOA It was adequate but very close to some busy train tracks. 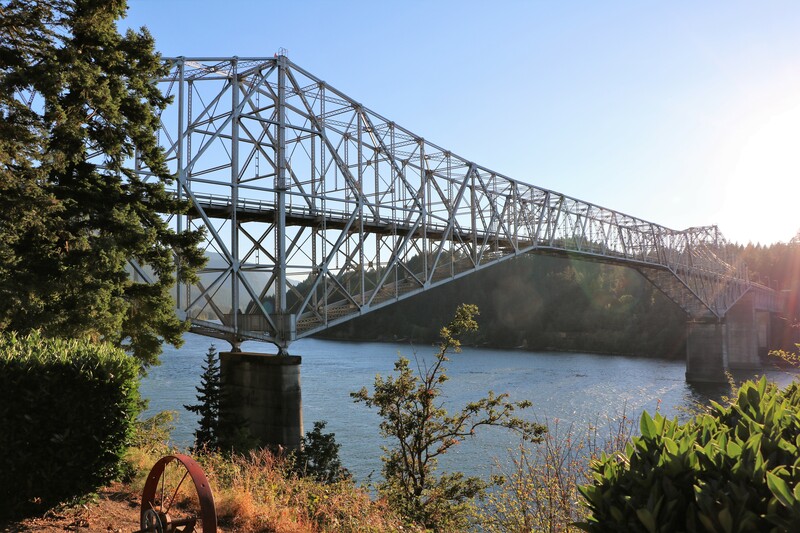 Bridge of the Gods is a toll bridge that crosses the Columbia River and connects Oregon to Washington. At one time, there was a land bridge in the area called “Bride of the Gods” which spanned the river and allowed Native Americans access to both sides. According to historical accounts, the natural structure was destroyed by geological activity in 1690. 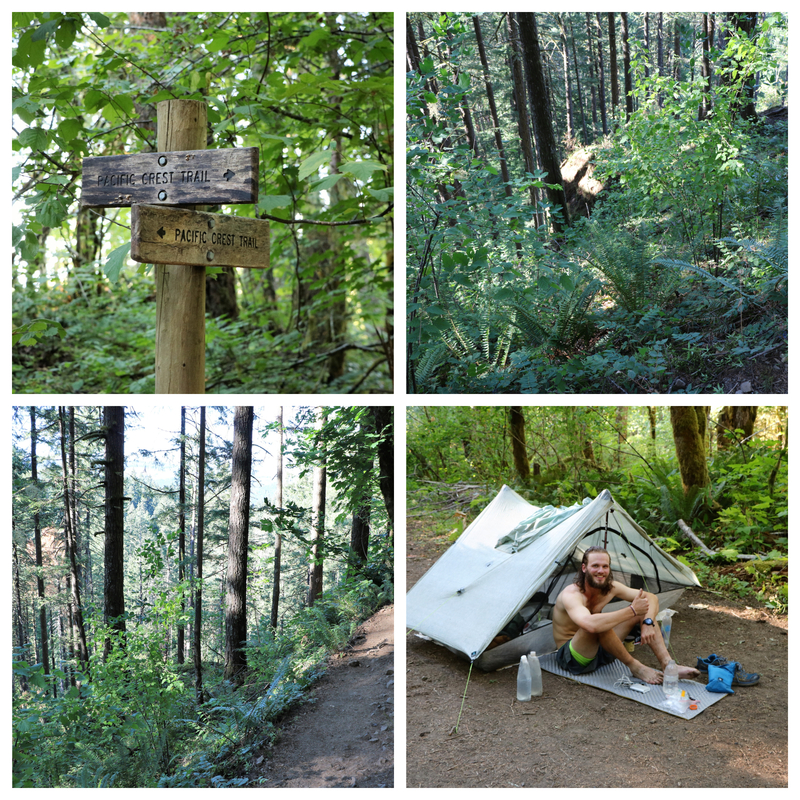 The Pacific Crest Trail passes right through Cascade Locks. It’s mile number 2,155 on this famous 2,659 mile trail that goes from the Mexican border by Campos, California to the Canadian border at Manning Park, British Columbia. Roy and I explored a bit of it and we met a hiker who was celebrating he’s 100th day on the trail. I gifted him some oranges I had in my backpack and he graciously allowed me to take his photo. I followed him on Instagram so I know that 24 days later he made it to Canada. Hats off to him! 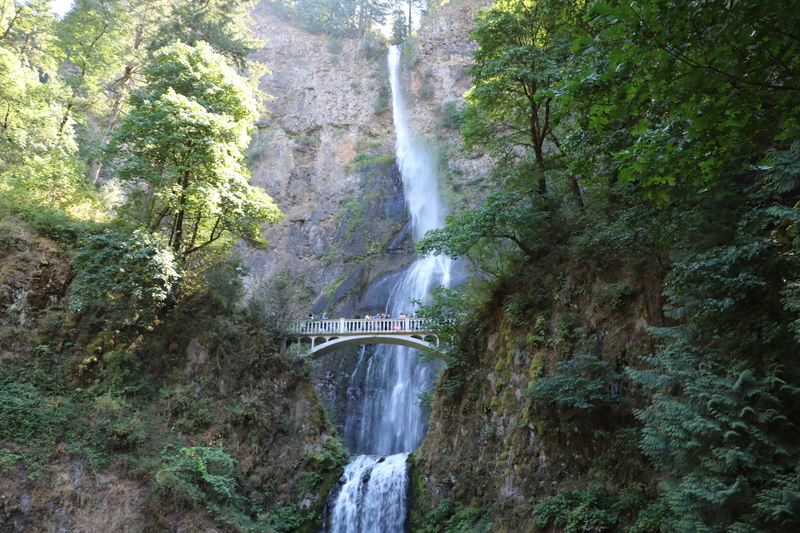 We visited the tallest waterfall in Oregon, Multnomah Falls which is just a short drive from Cascade Locks. It was jammed full of people and has a small visitors center and restaurant. 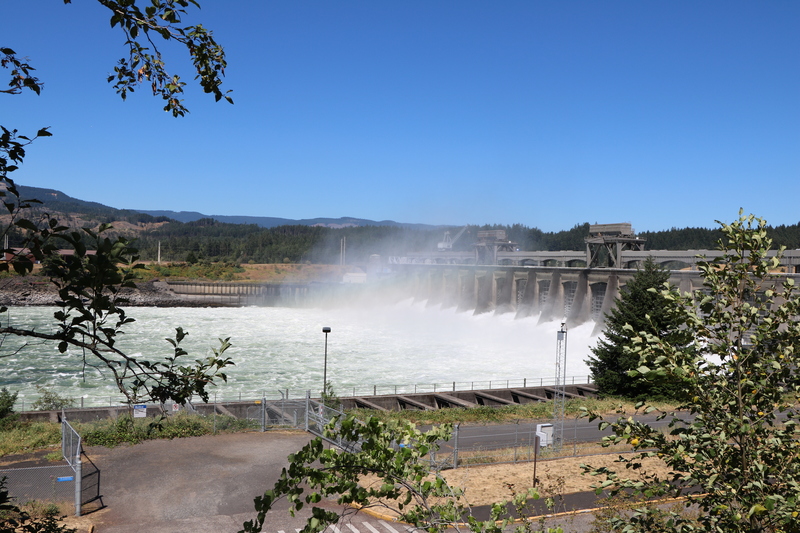 The Bonneville Lock and Dam is just 15 minutes south of Cascade Locks. It has a really interesting visitors center. In the very bottom level there are windows where the “fish ladder” can be viewed. You can actually see fish going through a series of pools so they can get past the dam. The dam was built in 1938 as part of FDR’s New Deal program and the original parts of it are a historic landmark. Before this point, we had been embarrassingly clueless that we were going to have a hard time finding a reservation somewhere in Oregon due to the August 21 Eclipse. 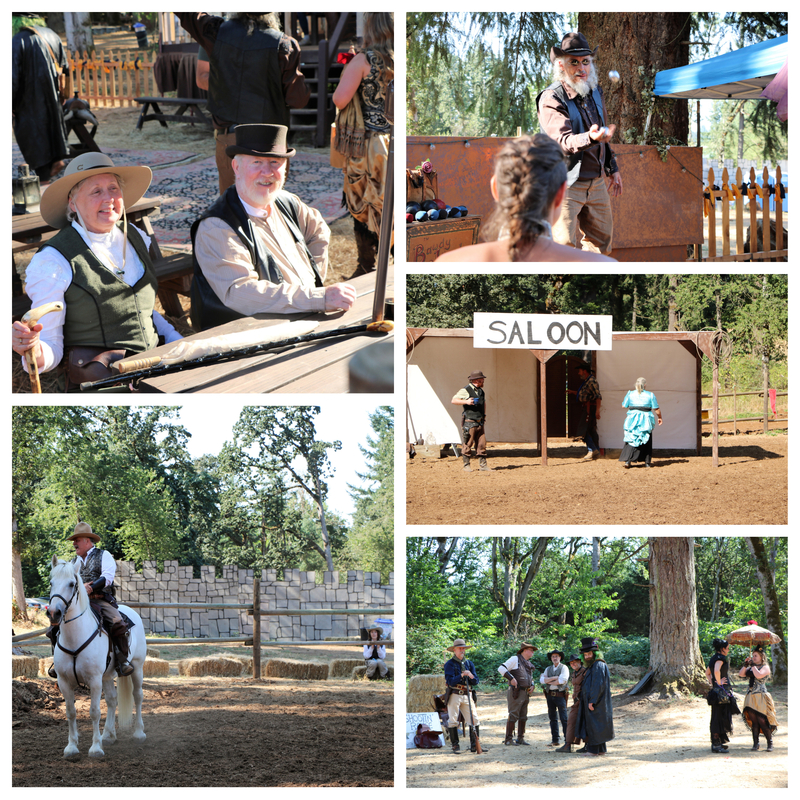 We spent a few hours on the phone until we found a “Wild West” show run by two sisters in Silverton, Oregon. One of the sisters said we could “probably” stay on their property for the eclipse, so we started making a way there. Since that part of Oregon was in the what was being called the path of totality, we were worried we would be getting into huge traffic and large crowds, but we went for it anyway. We needed a tiny bit of RV service, so we stopped at Guarantee RV in Junction City. Besides doing a great job on our RV, they also let us spend the night in their “RV Park” – a place to park while rigs are being serviced. 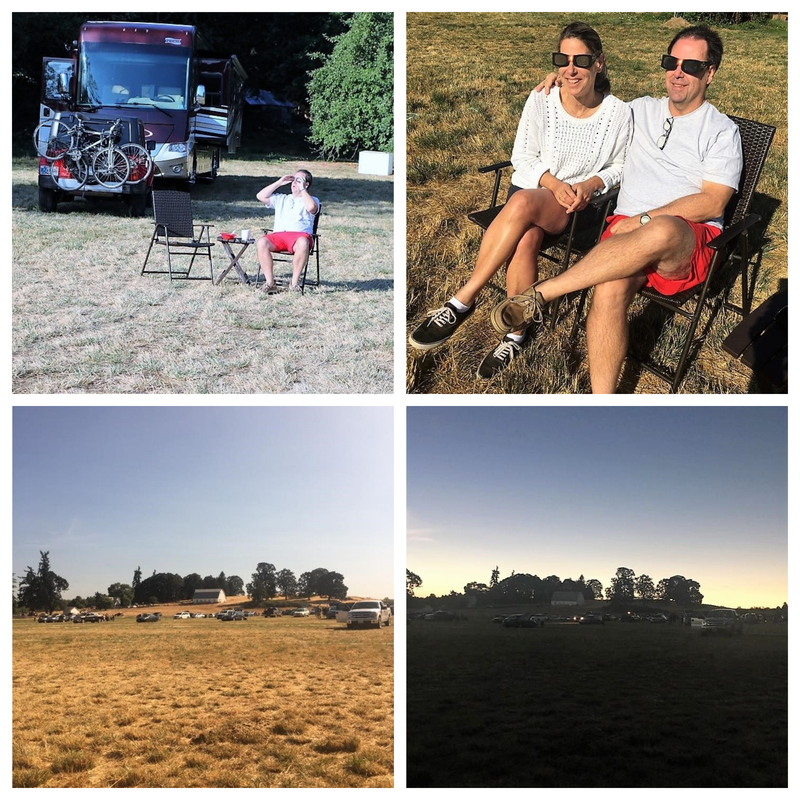 We got to Whitewind’s Wild West Show on Saturday and parked in their huge parking lot which is essentially a field. The property is well known around those parts for a yearly Canterbury Renaissance Faire The sisters/owners were trying a wild west show with the same staff on the property for the first time. It was fun and a little bit funny too; the actors had traded their medieval costumes for western garb and I suspected we were pretty much seeing the same event, just with a cowboy twist. Every now and then a performer would say, “Lords and Ladies”, and then catch their selves. We bought a two day pass and made a large contribution that enabled us to park their over the weekend. The eclipse on August 21 was so cool! Roy and I gazed at the sun through our special sunglasses and watched the sun get totally covered up by the moon. It got fairly dark, but was still light around the horizon. As soon as one silver of the sun peeked out from the moon, it instantly got light again – like someone had thrown a switch and football field lights turned on. There was still an eerie atmosphere to everything though until the sun was completely out of the moons path. We didn’t see any evidence of an eclipse traffic jam until we left Silverton that afternoon and headed towards Newberry RV Park in La Pine. It took us about twice as long as it should have to travel there and once we were there, we were disappointed that the park was just that – a place to park in a parking lot. But – it was close to beautiful Bend and some great places to see. 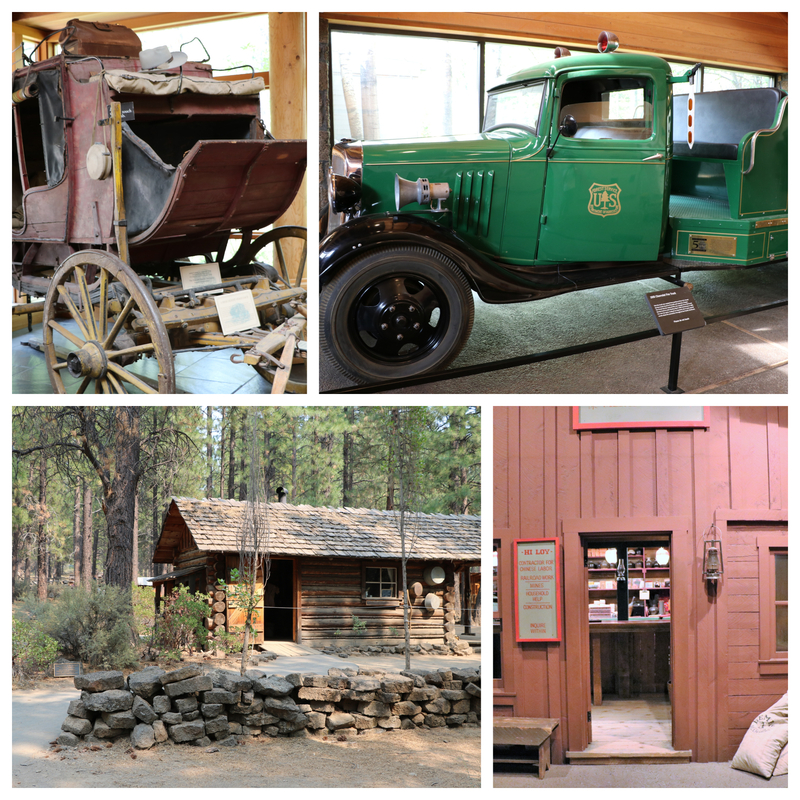 We enjoyed the High Desert Museum It is quite large and has an inside building as well as an outside area. Its focus is not only history but also wild life. 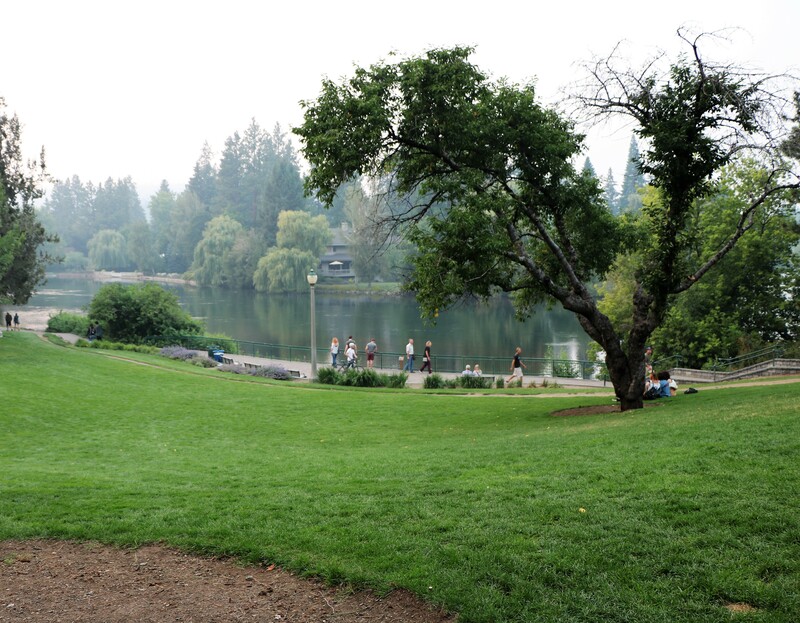 The city of Bend has nice downtown area with lots of restaurants that are a stroll away from Drake Park and Mirror Pond. 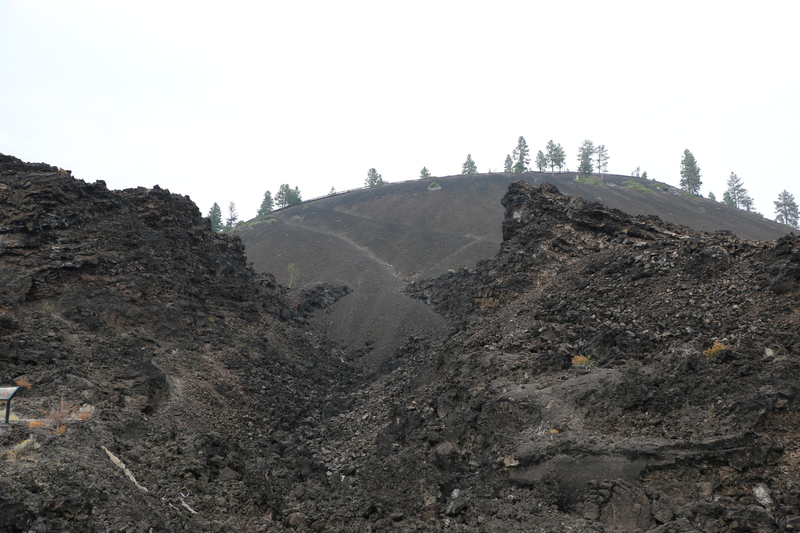 After viewing charming Bend, nearby Newberry National Volcanic Monument seems like another world. It’s in the Deschutes National Forest and is managed by the U.S. Forest Service. We hiked around the Lava Lands Visitor Center. 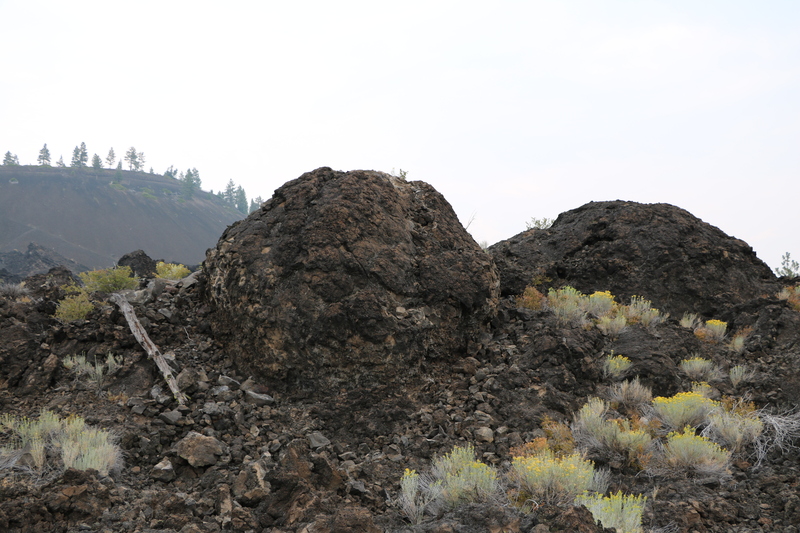 Those giant boulders in the photo above are lava snowballs. We caught a shuttle at the visitors center which took us to Lava Butte. 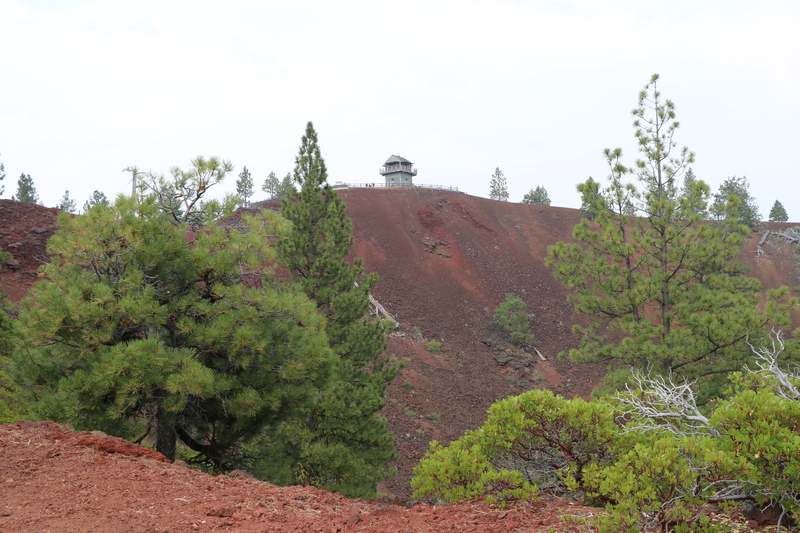 It’s a 7,000 year old cinder cone on the edge of the Newberry Volcano. We enjoyed the easy hike all around the rim. The lava that exploded out of the hole we walked around was thought to have flowed up to six miles outward. We ended out time in Oregon by going to see Crater Lake and the Umpqua National Forest area. 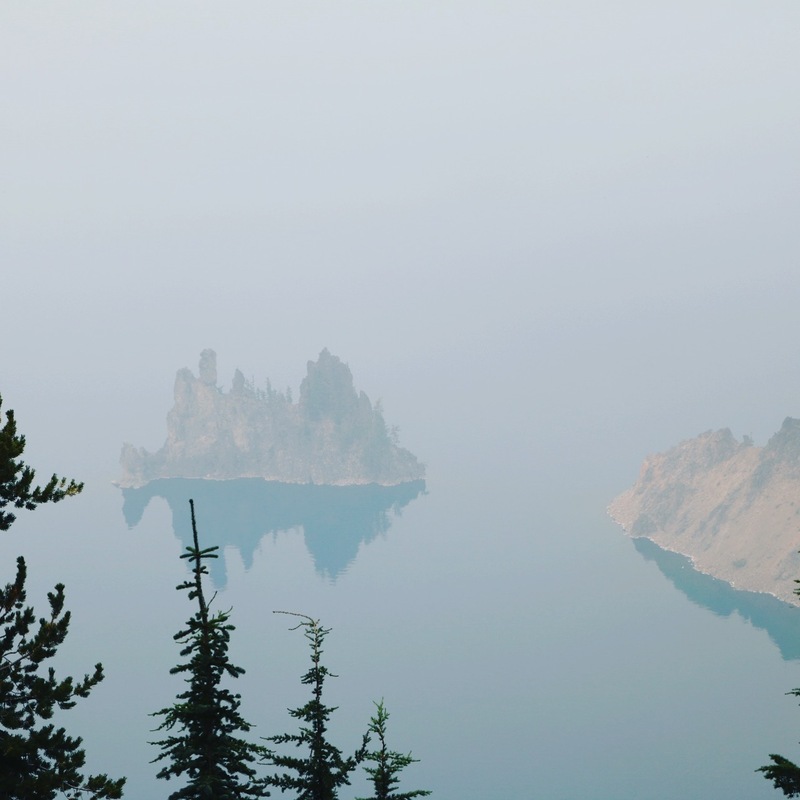 Crater Lake National Park is supposed to be a once in a life time bucket list destination known for the breathtaking views of the lake and the bluest water imaginable. Unfortunately, due to the smoke and ash in the air from forest fires, the photo above shows the limited amount we could see. Thirty-three miles of the Pacific Crest Trail goes right through the park, and hikers had to deal with sections that were closed due to the fire. We did a little hiking in the park, but we couldn’t see any of the pretty vistas and were a bit spooked by the ash that was floating down on us. We stayed at Diamond Lake RV Park which was adequate. 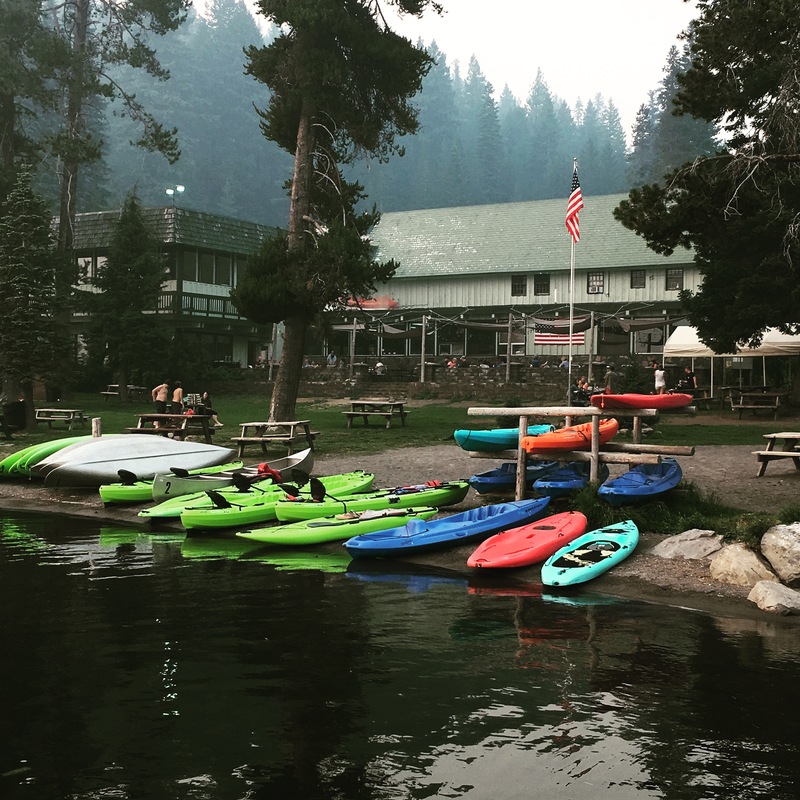 The best thing about it was that besides being near some hiking opportunities, it was right down the road from the Diamond Lake Resort. This place was like a throw back in time; apparently families book there year after year. 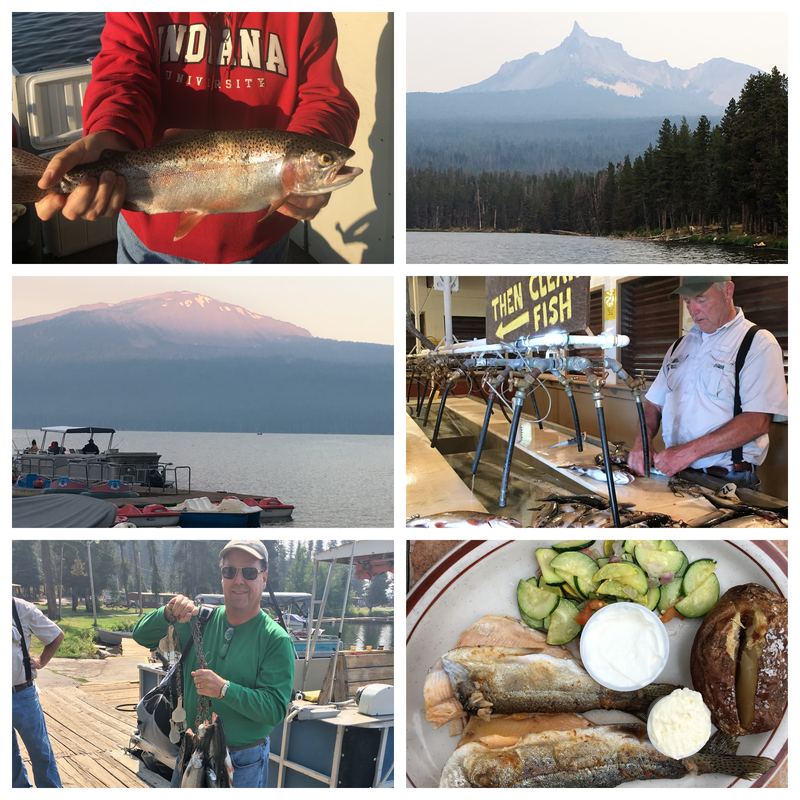 They offer charter fishing on beautiful Diamond Lake for $80 per person. Since our views of Crater Lake were so limited, we opted to go fishing. We left shore about 7:00 a.m. and were enchanted by the views of sharp pointed Mount Thielsen and rounded Mount Bailey. The captain did everything he could to make sure everyone got a mess of fish. When we got back on shore, he cleaned the fish for us. Then, the restaurant at the lodge cooked up our catch. For $11 and some change, they cook up 2 fish plus give you a salad, vegetable, and baked potato. Our waiter said as people check out, they make reservations for the next year. I would love to return myself! Then it was time to move on to sunny California!